This is literally me when I’ve got a little too carried away with the accessories on a night out. However, I’m not sure why you would EVER want to look like you’re wearing a cauliflower as a headdress on your wedding day. I think it’s meant to resemble clouds but when I look at it, all I see is cauliflower. At least it’s…different. 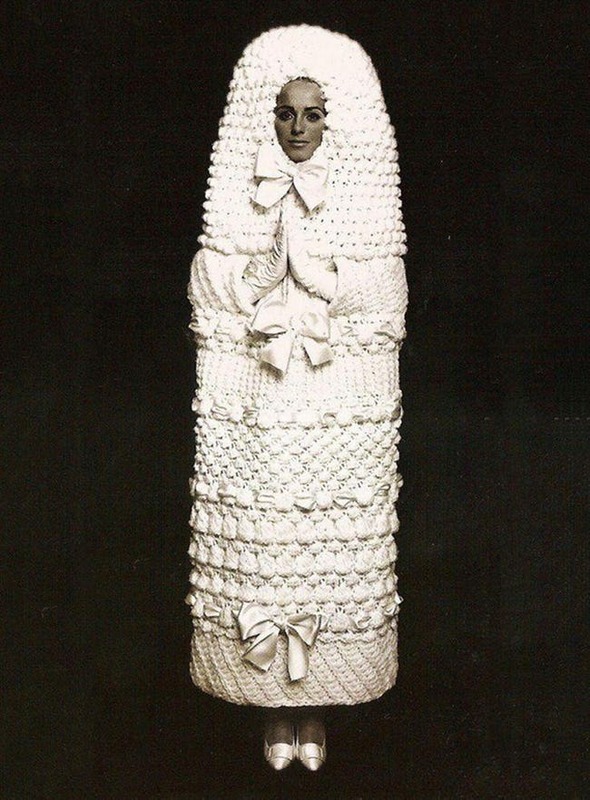 On your wedding day, do you want to feel like you’re wrapped tightly in a cocoon and can’t move at all? 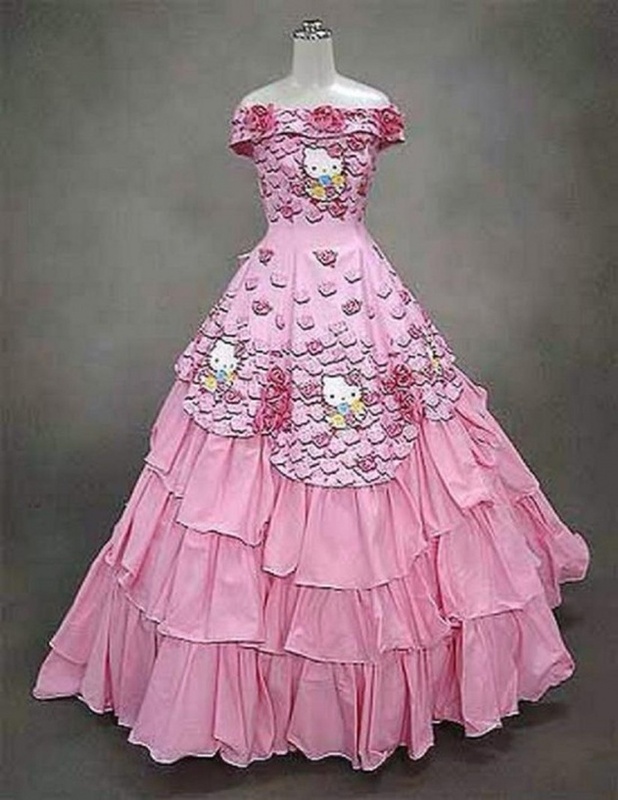 Then this is the dress for you! I would love to see her try and walk, I bet it looks hilarious. 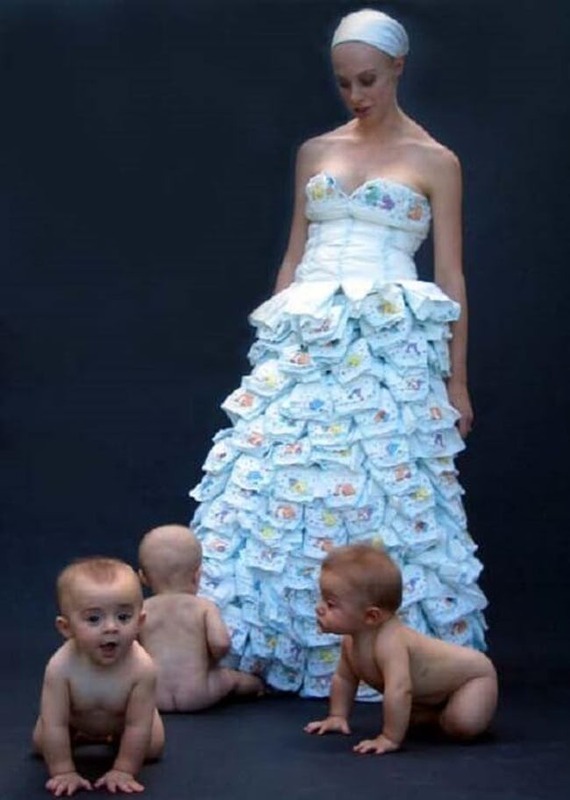 When you are overrun by babies that it’s just more practical to carry diapers around AS your dress. This is perfect for a bride who has lots of young children. It’s practical AND pretty. Expect the second part was a lie. This bride decided that wedding dresses were too mainstream and she would prefer to just wear absolutely nothing at all! Just because she is covered in body paint though, that makes it completely acceptable. I wonder what they would do if it rains? 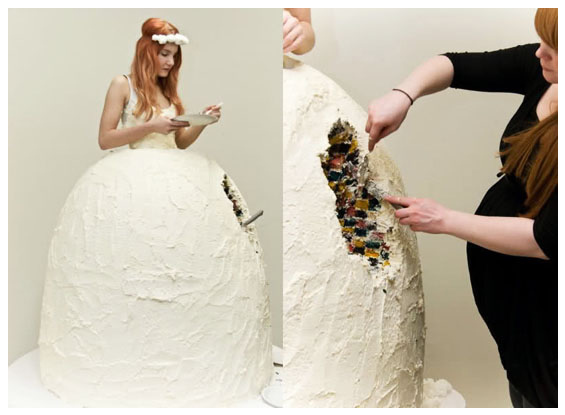 If you are incredibly brave and trust everyone at your wedding enough NOT to pop your wedding dress, then this is perfect! 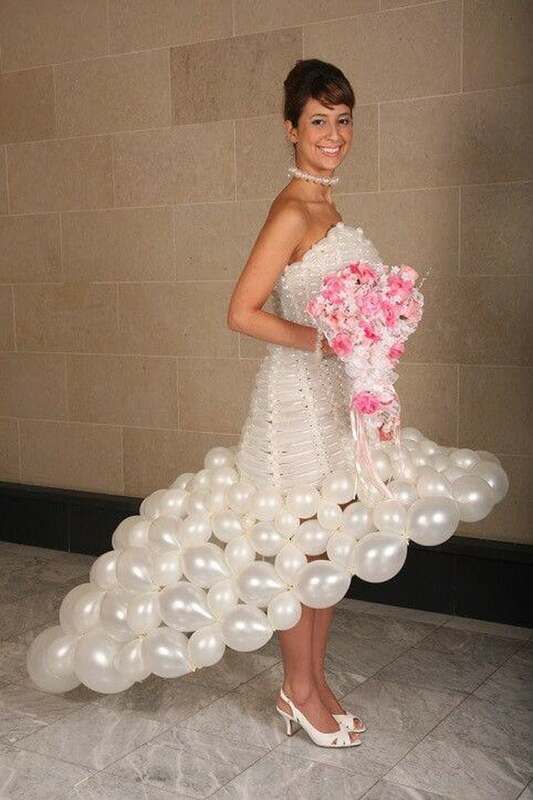 She would save a lot of money too, all she needed was balloons! 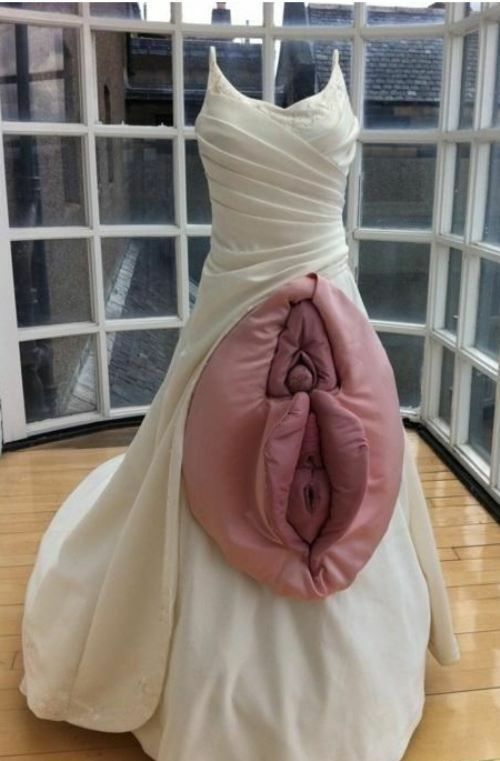 I wonder how awkward it was walking down the aisle, imagine the SOUNDS it would have made. 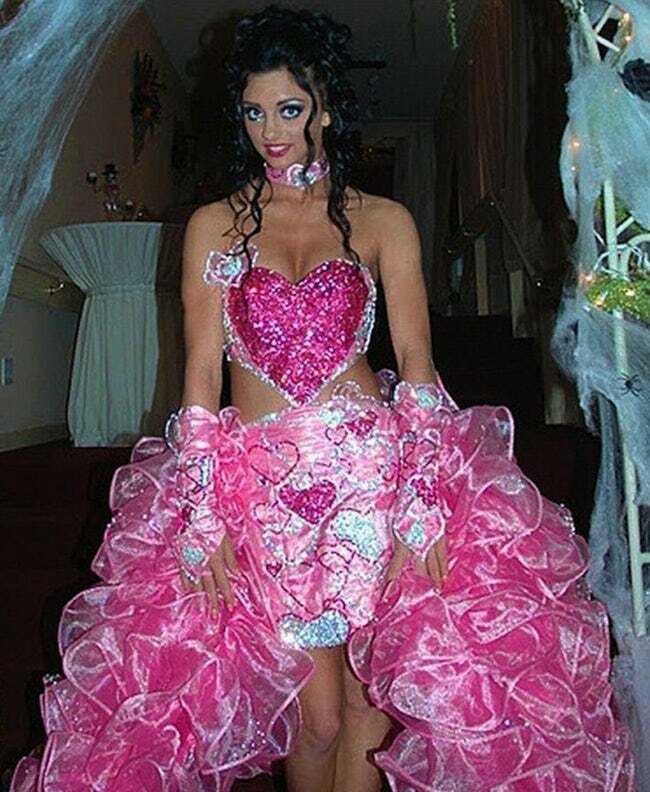 This bride just wants everyone to know that she is very much in love WITH HER HEART. She want’s it made clear that she loves pink and glitter too. I mean, it stands out but it’s a bit much for my liking. Maybe that makes me boring. 14.) Where’s the bride gone?! 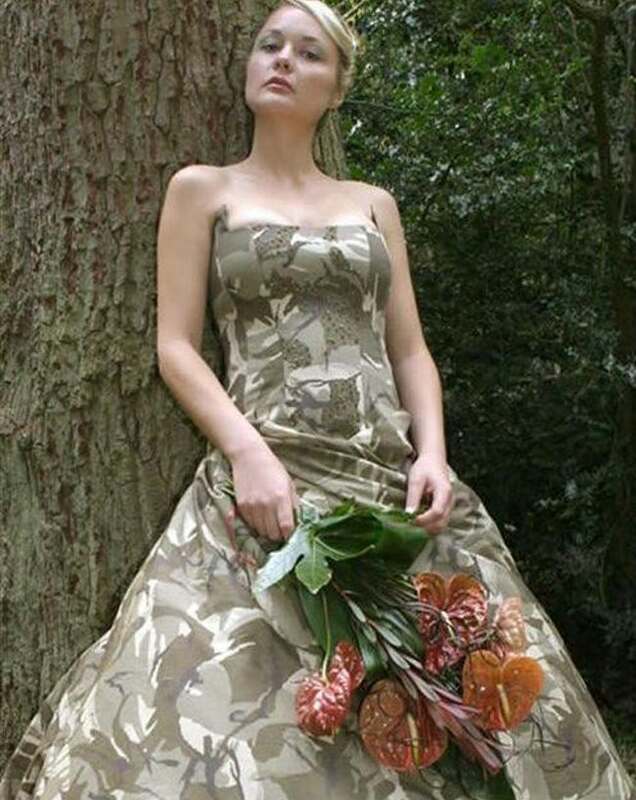 If you want to constantly lose your bride throughout the day, this camouflage dress is the one! Maybe she just wants to constantly hide from the guests and avoid hugs and calls for speeches throughout the day. Thinking about it, this is a genius idea! This dress makes this woman look like she was just ravaged by a wild animal but managed to escape. 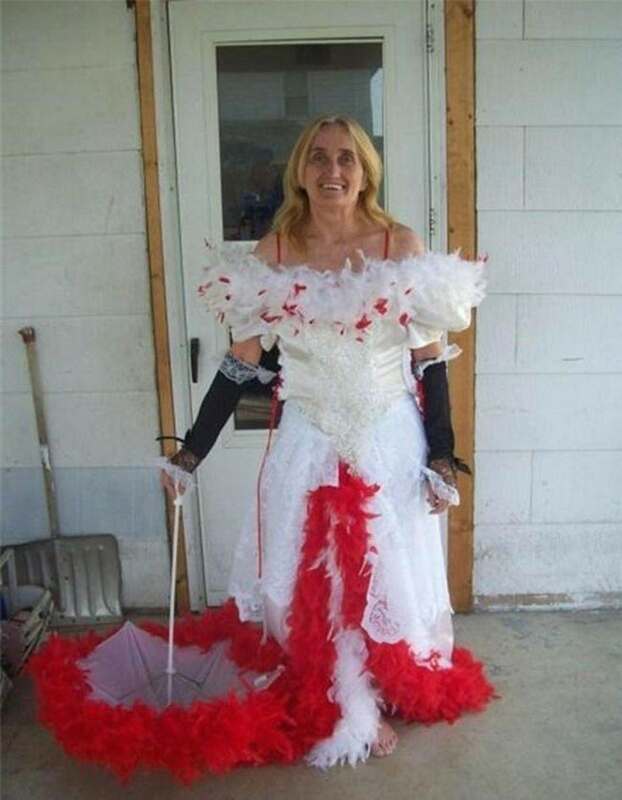 She has been living in the wilderness for weeks but she managed to find her way home and make it to her wedding on time! What an incredible story this dress tells. 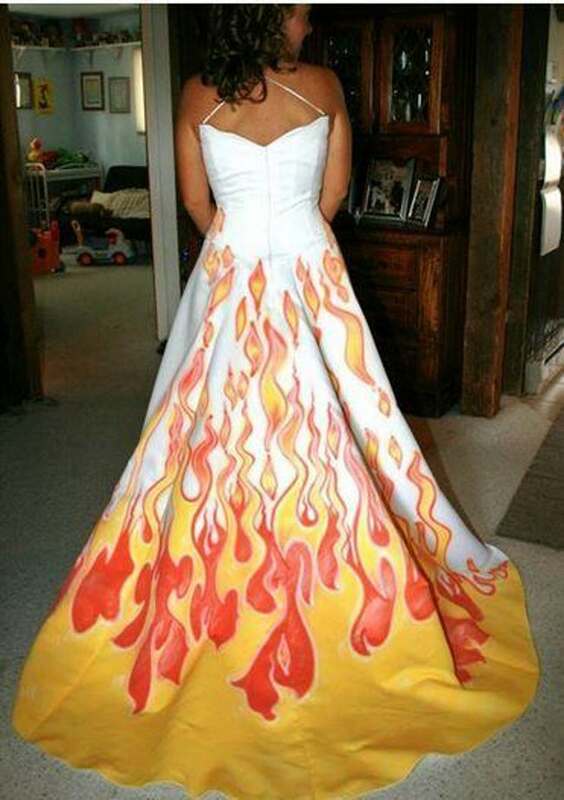 This woman clearly thinks that both herself and her wedding is on FIRE. 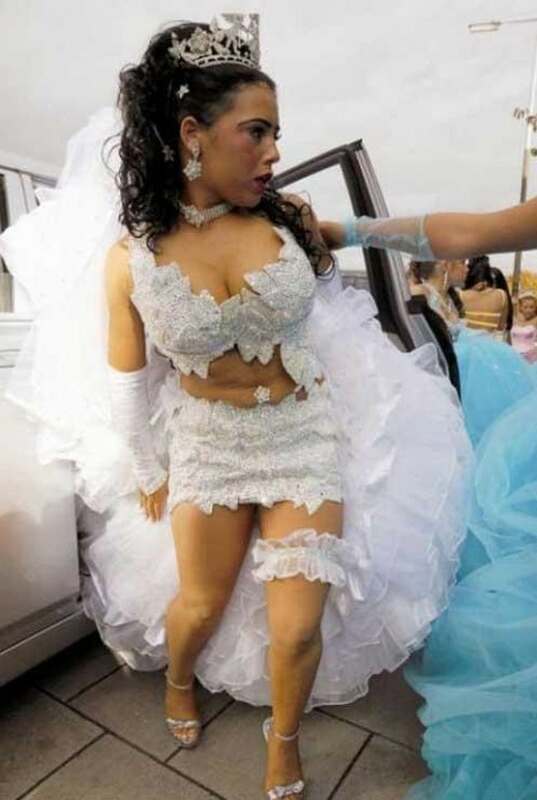 She really is turning up the heat on other wedding dresses and everyone else is just burning up. 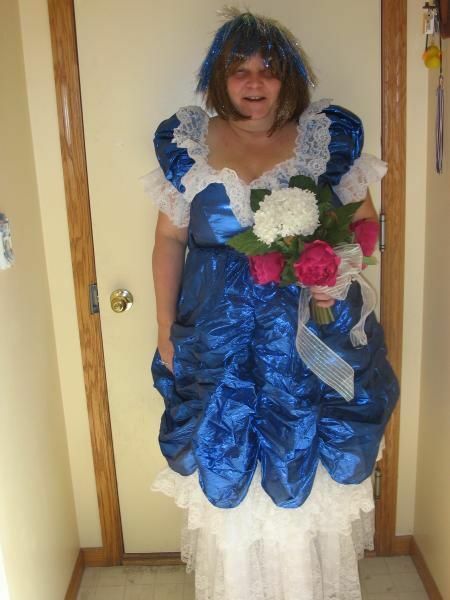 She will walk down the aisle in a cloud of smoke. I can’t decide whether this is just an unfortunate dress design or if she’s on her period and no one decided to tell her. Either way, it’s definitely not pretty. 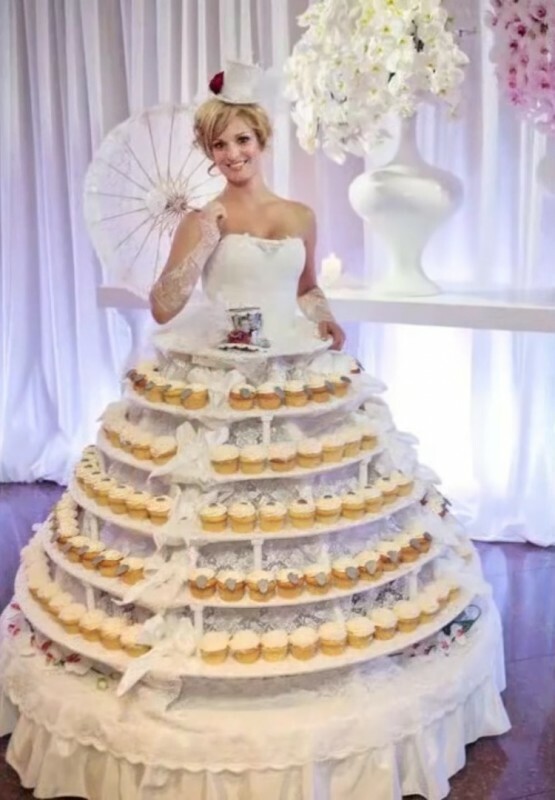 If you want your wedding dress to look as unflattering as possible, then this is the one for you! Not only does it look hugely uncomfortable to wear, but all of the guests are also going to be extremely uncomfortable seeing this. 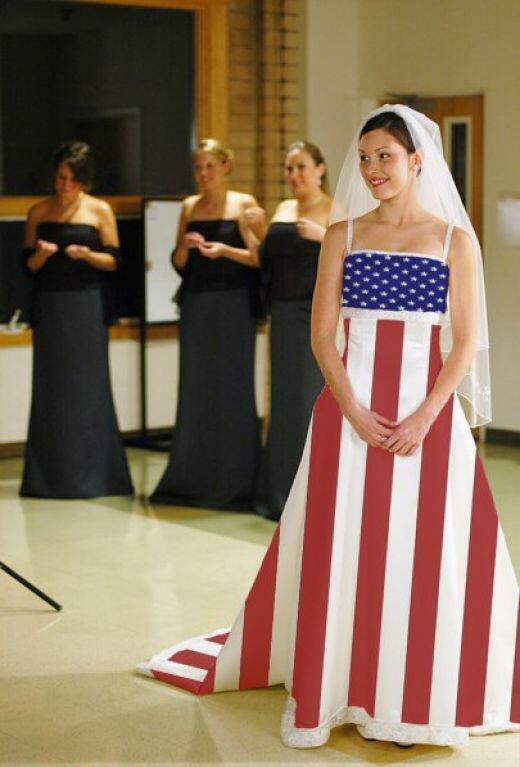 This bride is clearly VERY patriotic and just HAD to let everyone know on her wedding day. It’s fine to love your country and all but do you REALLY need the flag plastered on your dress?